Primordial have been around for quite a while now, and truly are one of Ireland’s best bands. Throughout the years Primordial has changed ever so slightly as they have always maintained a strong folk feel in their style of Black Metal, which at times was quite melodic and emotion driven, mostly helped by the heavy use of clean vocals and the epic compositions. It is right to say that Primordial aren’t a 100% straight Black Metal band, and that helps them stay unique. This time around Primordial has changed their style though, not in a huge way, however, they have changed enough that some long time fans have been disappointed with this release. A lot of the emotion and melody of the band has been replaced with more aggressive elements and a more violent feel to the music. This also means more traditional Black Metal elements, and more of the harsher vocals, with less clean vocals. Of course, the band is still quite epic, as they still include cleverly placed acoustic guitar passages and an impressive amount of mood changes along with extended bits of instrumentation. The melody and emotion is still there, just not quite the way it was before. Primordial have by known means dummied down their sound or style, it’s still the same old band, just with a more aggressive take on things. The Heretics Age and Suns First Rays are two of the best examples of the more Black Metal driven style, and you know what, these are my two favorite tracks on the CD. They have not compromised their Celtic Pagan feel or their integrity by writing simpler songs, but I can still see why some people have been disappointed. Most of the melodies on Storm Before Calm are very catchy and long time fans shouldn’t be disappointed with Cast To The Pyre and Hosting Of The Sidhe, as they are most similar to the style heard on Spirit The Earth Aflame. 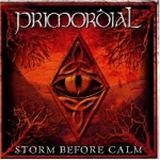 There are some truly memorable moments on Storm Before Calm- those epic moments that Primordial are known for still populate the CD. The production isn’t as good as it was on Spirit The Aflame though; the guitars aren’t as clear and some of the melodies are sometimes too easily lost amongst the rawer sound. The lyrics are still top notch, and the vocals from A.A. Nemtheanga and the rhythm section consisting of Pól MacAmlaigh (bass) and Simon O'Laoghaire (drums) has never been better; including audible and impressive bass work that carries some sections. In regards to my final thoughts on Storm Before Calm I am torn. On one hand, I miss some of the folk elements and songs full of emotion, but on the other hand I really like the more aggressive style, along with the inclusion of less clean vocals. Most of the tracks on Storm Before Calm are solid, although Sons Of Morrigan came across as being very bland, and Cast To The Pyre has some uninspired moments (but considering the song is 7+ minutes long, the good parts still save it). You will have to make your opinion on this release based on what I’ve told you, and decide whether or not the elements I’ve mentioned appeal to you, or have turned you off. If you’re new to Primordial and enjoy melodic Black Metal, the kind that also includes folk elements and an epic song writing style, than you might want to try Primordial, even if you don’t like Black Metal (although liking Black Metal helps). My final score is based on a middle ground that best represents my like and dislikes of the new found style of the band.